I have been reading every page on this forum for the past couple of weeks and it helped me in making me initial purchase decisions. 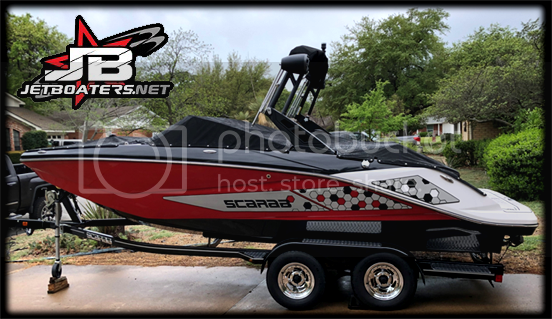 I picked up a 2019 AR240 from Phil Dill Boats out of Lewisville, Tx. It was actually really bad weather this past Saturday. I am very impressed that I was able to get up to 43 MPH with 3 adults in 3-5 ft waves. Anyway some of the things I found during my inspection. 1. Anchor locker drain needed sealed. 2. Scuff on bow where our guy missed the trailer during the test drive. Things that I wish I would have found. 1. Trailer brake rotors are grooved on the outside of both sides, but pads have plenty of meat left? 2. Table bracket installed upside down. 3. Loose hardware in engine compartment. What lake are you planning on using your boat at? Yes sir it is my first boat, but I grew up going to the lake almost ever weekend. The hail came a little later so I just missed it, but I did encounter really high winds on the way home. I will be primarily going to Possum Kingdom, Texoma, Arrowhead and maybe Bimini next year. Welcome! I was a 7 year Sea Doo Utopia owner operator and just bought an ‘09 AR230 last month. Hope you get all the issues resolved with the dealer, and best of luck with your new boat! Just to double check, you've seen the posts about loose bolts and clamps? Battery DSVR ground not connected. I hear a lot of good things about that dealer. I found that for the little things (loose screws, etc. ), I just tighten them myself rather than inconveniencing myself by bringing in the boat to the dealer. I also found loose hardware to basically be the norm on my boat. Go through and tighten everything... While I was at it, I unscrewed everything and added antiseize, just to make my life better later. Odd that the rotors are groovy on only 1 side. Symptomatic of a stuck caliper, but only if the pad is well-worn. Should not be the case on a new trailer. Any other evidence of age on the trailer? Rusty bolts, etc? These boats to handle pretty well even in the rough. Unfortunately with the Yamaha's there are a few build quality issues. Most all of them, like the drain plug are easily fixed. Make note of the things you find, and if they're not critical, then have the dealer address them at your 10hr service. Do yourself a favor and replace that bow roller on the trailer as soon as you can. That hard plastic POS that's stock will scuff the bow. Search the forum for Stoltz. I have seen the one about the DSVR ground, not the others thanks. The trailer had some rust on some of the hardware but nothing major. I am happy to report the dealer seems to be very supportive about the issue they have offered to send a couple of guys 2 hours away to fix it. They are basically bringing everything on the brake system. I have offered to do the repair myself, but they insist that it is a new boat and I should not be having this type of issue. The buying experience was really good as well, I didn't really have to haggle very much, and they didn't try to sneak any extras in. I am sure others have gotten better deals, but I feel ok with the deal. In my original post it may seem like I am complaining, I am only attempting to communicate to others the things that I have found so they can be on the look out for them as well. I only asked the dealer about the trailer brakes because I do not want to buy the parts myself. I honestly don't trust others to work on my machinery. The dealer was supportive of this as well they said doing my own 10 hour inspection wouldn't void the warranty as long as I used Yamaha parts, kept the receipts and did things correctly. I have been procrastinating on the bow roller, you caught me. Congratulation on the new boat! Check out the Tacoma meet in the gatherings section. We just bought ours from Phil Dill too-they do swap out the stock bow roller but not sure if it’s a Stoltz. You guys/gals know about the Texoma gathering at the end o July right? Yes the one I received was not the stock yellow plastic one. I did see that, I am working to make that one. It looks like a good time, I am hitting Possum Kingdom, Sandy Beach this weekend. I purchased my boat from Phil Dill's as well. My boat was 10 years old when I bought it, so I tried to think of everything to inspect before purchase. I would contact them with anything you need to have done. They are very accommodating. They even touched up the upholstery and a couple of little dings in the gel coat in the cabin after I told them about it later.